You are Bob Ross, a great painter and businessman. But power corrupts you, and to pursue your greedy goals, you become a monster. You must become the richest Bob Ross in the world. In order to do so, you must collect and sell the most valuable asset in the universe: the Wilderness Trail™ paintings. And to do that, you must hunt down and capture as many Wild Bob Rosses as you can, to bring them back to your sweatshop and enslave them. The more enslaved Rosses you have, the more Wilderness Trail™ paintings you produce. The Wilderness Trail™ paintings are used as ammunition and as food, so manage them well. If you starve, you die. Beware of the Military Bob Rosses. They will pursue you and kill you for enslaving Wild Bob Rosses. This game is a submission to the Paint Jam 2018! It will be updated in the future to include more planned features, though. Left Mouse = Fire Wilderness Trail™ paintings. Right Mouse = Eat Wilderness Trail™ paintings. E = Pick up Wilderness Trail™ paintings / Carry sleepy Bob Rosses. R = Drop sleepy Bob Rosses. The only way to close the game at the moment is with alt+F4! - Wilderness Trail™ paintings serve as both ammunition and food. Keep an eye at your food meter and make sure it doesn't reach 0, otherwise you're dead. 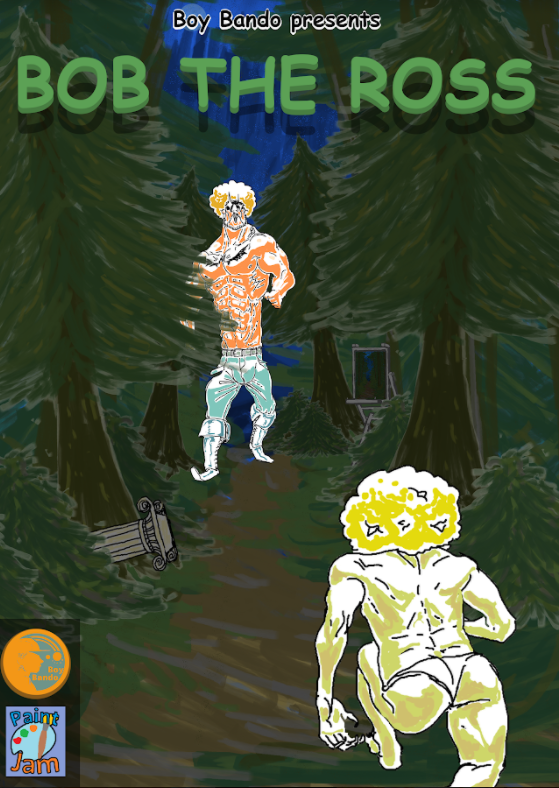 - Use the Wilderness Trail™ paintings as ammunition to make Wild Bob Rosses unconscious, then drag their bodies to your sweatshop to enslave them. They will begin to produce more Wilderness Trail™ paintings for you, the more slaves the better. - Defend yourself against the Military Bob Rosses. Shoot Wilderness Trail™ paintings at them to kill them and make sure they don't hit you! There is no way to recover your health. Make all your own sound effects using only sounds you can make with your mouth? We made all the sound effects with our mouths, but forgot to replace ONE placeholder sound (walking) in the end. I hope it still counts. Just unzip the file with 7zip or WinRar, then open the .exe file. The only way to close the game at the moment is with alt+F4!